Over here I have a lot of stories humming about inside me. Stories I want to share with you. Stories I want to write into a journal. Stories that are almost begging to be put inside an art journal that is patiently waiting for me to dive into. Stories that need to be put down because they are getting too heavy to carry. When I feel full to overflowing like I do today and know that I won't be able to get to these stories right now, I have to literally make a list of them so I don't forget. The truth is that they can kind of escape when the overflowing happens. The lines and ideas that are weaving there way around my mind and heart might escape through a side door and find someone else. So I have to get something onto a page. 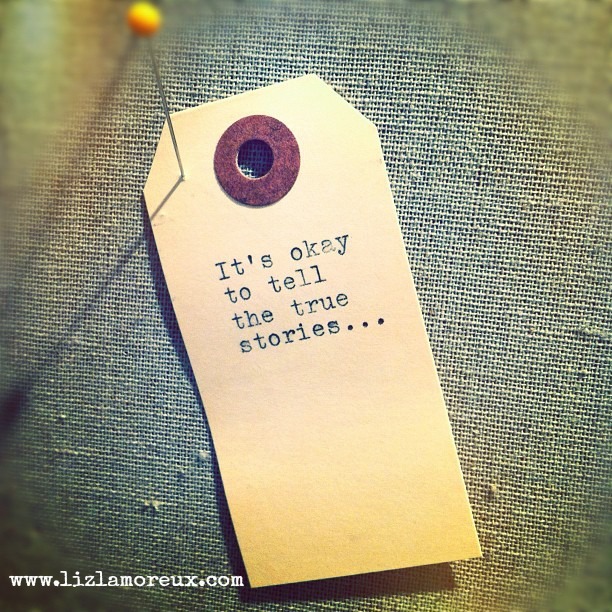 Most importantly I remind myself over and over again that it is okay to tell the true stories. The uncertainty around this can come up when the list writing begins. I find myself pausing and thinking, "Oh not that one. I can't write about that one." But this is the magic of the list. It is just ideas onto the page. It is a space to hold the stories until you can unpack them into more details and into another container that will gather the details. That next container might be a blog post, a story for my newsletter, an ecourse, a story I want to tell at one of my retreats, or even pieces of a new book. What do you do when the stories are overflowing inside? Do you make a list? Do you ignore them? Do you pretend that you don't really want to tell them? Do you just start writing, creating, painting, playing? My hope for you is that you seek out the spaces where you feel safe to tell the true stories: a journal, with a friend, on a stage, on your blog, in a private community, and how the list goes on. You deserve to tell your true stories honey. PS Updating this to add that I love Glennon Doyle Melton's take on letting the idea go when your hands are full. So if you suddenly have a story idea appear while you are in the middle of something in your life that needs you more than the story does, it's okay to let it go into the wind. Maybe it will come back to you; maybe it will move on. Believing in abundance is a very good thing.